Growing up my mom made yogurt from scratch. She had a countertop yogurt maker that made the stuff in little cups. I wasn’t one of these newfangled babies who loved yogurt. I hated it with a passion and if you can believe it, I only started eating it when I turned 30. I also hated whipped cream and didn’t have my first lick until I was 25. I’m weird like that. Now I like yogurt and I eat it for breakfast when I’ve got granola to go alongside. A couple of months ago, I was offered a free Crock-Pot. I usually don’t accept a lot of free offers, but I had been curious about slow cookers after a friend had told me that she really liked hers. So I jumped and said yes, please. The first thing I made – a beef stew – wasn’t very exciting, though I blame my lack of recipe more than anything else. I put the slow cooker aside and decided that the next time I pulled it out, I’d make something a bit more interesting. Homemade yogurt, that’s pretty interesting, right? So I searched out a couple recipes online and it turns out it’s pretty simple to do with a slow cooker. Even if you don’t have a slow cooker or one of those ’70s yogurt machines my mom had, it’s pretty simple to make from scratch (instructions for people without slow cookers). So I got the best organic whole milk I could find and used the organic yogurt I already had in my fridge. That’s it, people! Originally I heard that using whole milk was the way to go. Whole milk shouldn’t be confused with the 3.25% homogenized milk sold in Canada (I got confused too). Whole milk still has bits of butterfat in the milk – you can see it in the picture above. It supposedly makes a creamier and thicker yogurt than using skim or homogenized, so that’s what I went with. The recipe itself is simple – heat up the milk, let it cool, add in the yogurt, let it sit over night wrapped up in beach towel. Yes, a beach towel. It insulates the crock pot keeping in the heat. There’s a lot of waiting around, so it’s best if you start this in the early evening (about 6 hours before you go to sleep) and 12 hours later you’ll have fresh, delicious tasting yogurt. Below is what it looks like when it’s done. It’s pretty runny! I’m not sure this is a penny-pinching recipe because organic whole milk where I come from costs about $3.19 for a 1 litre glass bottle and you’ll need two bottles (with some leftover milk for your coffee). The resulting yogurt was 2 and a half medium sized jars worth of yogurt, less if you strain the yogurt afterwards to make Greek-style yogurt. A tiny bit of savings, but nothing to really write about. Still, it’s homemade and you know exactly what went into it and there’s no waste – especially since you can use your homemade yogurt as a base on your next batch. I’m happy with the results and I’d make it again. Also, now that I’ve got this thing, I’d love to hear your favorite slow cooker recipes! Like can I put dried beans in there and will they cook up nice and plump? The book I took out from the library said no (they still require cooking separately), but I’ve since heard that yes, yes, you can. Help! 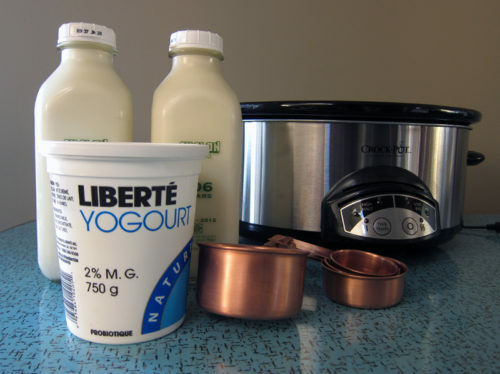 Turn your crock pot to low heat, pour in the milk and let cook for 2 hours & 45 minutes. Turn off the heat and let it sit for 3 hours. 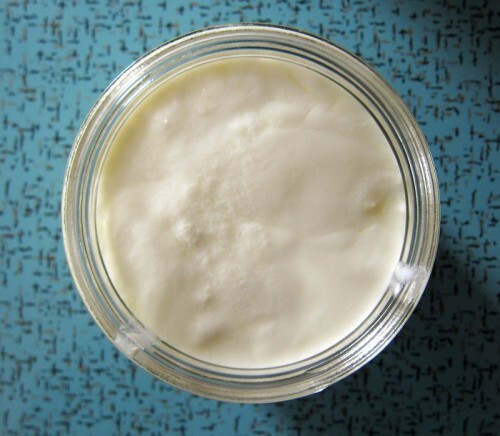 Skim off the dreaded milk skin and whisk in the yogurt. Wrap the entire crock pot in a large beach towel to keep in the heat and let sit overnight for 12 hours. Spoon yogurt into jars and refrigerate. Or, if you like a thick, greek yogurt style, use a coffee filter and a coffee pot to strain off the extra liquid as I mention in an old post. If you want to sweeten or flavour the yogurt, you can do so at this stage (here’s a version for orange yogurt). You can absolutely cook beans in the slow cooker! My roommate used to do it all the time. She would soak them in there overnight and then just change the water and turn it on the next morning before leaving for work. I think it takes a little practice to determine just how long to cook them for, but it definitely works. I don’t even soak my beans. I just throw them in the crockpot, cover with water, and put it on high. Chickpeas are the easiest, since they require little watching. A white bean will turn to mush as soon as you turn your back. It’s been a while since I made a pot, but I want to say a bag of chickpeas takes about 5-6hrs. I usually salt them well and throw a couple bay leaves in. Generally speaking, I’m glad to have my crockpot. It’s great when I’m making a vat of soup for a large group. Or, when we have a busy week. Yes, yes you can! Try a bean soup. Steel cut oats, or a whole chicken, just tucked in.. It’s not pretty, but the meat is so tender and juicy! Just cover and cook on low 6-8 hrs. You don’t even need to add stock or anything. Wow! I’m impressed with your adventurous culinary chops 🙂 My mom used to make her own feta-like cheese when I was a kid. Since it wasn’t Kraft process cheese slices, I avoided it like the plague. I was a processed food, junk food kid growing up. I’ve cooked dry beans in the slow cooker and it does a good job. Much better than pre-soaking and cooking them for endless hours. Just make sure you have plenty of liquid in there. I know someone who scorched their slow cooker by not adding enough stock. I once tried to make an egg-based cake (like Clafouti) in the slow cooker and it was gross. I tossed it into the garbage. Slow cookers are great for soups, stews, rice pudding, mulled cider, oatmeal, baked eggs in ramekins and all kinds of desserts in ramekins like, custards, creme caramel…anything that required bain-marie style cooking. Oh, and you can also re-heat food as well, like cooked rice, instead of nuking it. p.s. 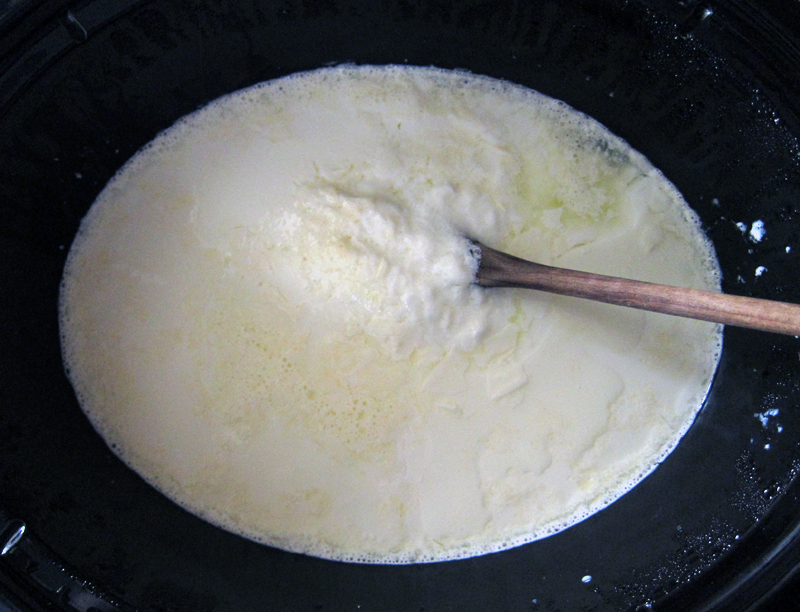 You can make your own butter too with just a carton of heavy whipping cream. You beat the crap out of the cream with your Kitchen Aid mixer until it’s over whipped and curdles (about 20-25 min). You will see it separating from the whey (liquid). You collect the solid bits, and with your hands smoosh it all together to form a log or a ball of some kind. This will give you sweet butter. If you want salted buter just add a pinch of salt to the cream. We made butter in my bread-making class and it was divine. You can also add finely chopped chives, garlic, other herbs or spices, to create a flavoured butter too. Just add herbs during whipping process. Oops sorry kickpleat, the butter recipe has nothing to do with the slow cooker advice. Joanne, I was actually wondering if I could just add dried beans to a soup and have them cook up. I saw one soup or chili recipe that said to add dried black beans, so I was curious because most of the recipes I saw called for adding cooked beans. Thanks Sarah, I’ll totally try making steel cut oats next! Julie, a whole chicken?!! I can imagine it would be super tender. Okay, I’m definitely curious about that! My mum used to make yoghurt at home too… by leaving the mixture on the radiator over night. Or maybe it was her aunt, I don’t remember! I’ve been thinking of making yoghurt for ages. My friend used to use the whey liquid after making paneer as the liquid for her bread baking – I wonder what the liquid after straining your yoghurt would taste like in bread? I like to “bake” potatoes in the crockpot. Just wrap ’em in foil and throw them in on high for 3-4 hours, depending on how many potatoes. Easy peasy. I also make machaca for enchiladas/chimis in the slowcooker. I usually use ground beef, rice, green chiles, tomatoes, and homemade veggie broth. On high for 3-4 hours, or low for 2x longer. 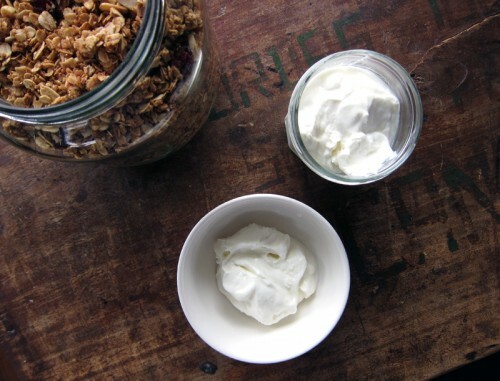 I’m so excited to read this post, since one of my cooking resolutions for the year is to make my own yogurt. I had not heard of making it in the slow cooker, but I do love using my slow cooker for lots of other recipes. I do a lot of the typical stuff like roasts, soups and stew. I also like to make hot mulled cider in the slow cooker when hosting a party. My grandmother used to make yogurt daily. Each night she would leave a pot out on the counter & I would have fresh yogurt for breakfast. 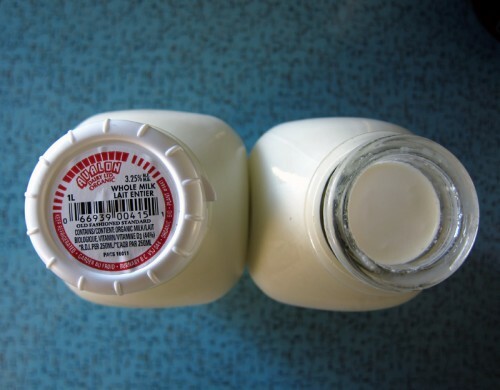 I watched her a million times but never made it myself – however, I remember that her method involves heating the milk till it’s warm enough that it doesn’t singe you if you dip a finger in & then pouring this into a bowl that had a spoon or so of yogurt in it. That’s all she did. And her yogurt was beyond delicious. Oh yeah, I’ve really been meaning to try to make yogurt and to do it in the slow cooker since I don’t like leaving my oven on for a long time. Anyway, if you’re just learning to use the slow cooker, you should check out the Cook’s Illustrated book on slow cookers, I think it’s called the Slow Cooker Revolution. Lots of tips for how to avoid the brown mush syndrome. I’ve also had excellent success cooking tough pork cuts like pork shoulder with a simple mix of spices and lime juice to break it down and make pork tacos. We make yogurt all the time, we just use a pot on the stove though. But same idea, heat up milk, let cool, add in yogurt starter, let sit at room temperature (may need to turn on the burner a bit in the winter) for 3 hours or so until it sets, then keep in the fridge after that (otherwise it will turn sour). I got a slow cooker for my birthday in November, and it’s been fun experimenting with it. It’s awesome for winter soups, but I can see myself using it a lot in summer too when it’s too hot to use the oven. I want to try yogurt and apple sauce soon! I just made a pound of beans in it. I did the soak overnight in the cold crockpot, then refill with fresh water & cook about 9 hours on low (add garlic/salt/spices too). I haven’t tried adding dry beans to a recipe in it yet, but I have seen ones that do this. I think you would need lots of liquid & the beans may need to soak first? I’ve really enjoyed the various pulled chicken recipes (BBQ, Mexican) that are great for sandwiches & tacos (there are a ton of these recipes but they basically involve sauce or salsa + spices + chicken, cook on low for 8 hrs – pull apart with a fork). I’ve also made a pumpkin-turkey chili, black bean/sweet potato chili, and minestrone soup (add cooked pasta at very end). Yum. I really want a slow cooker and this might be the recipe that sends me out to get one. It’s such a creative use of slow cooker! Thanks for sharing. Erin, that’s the same kind of liquid, so why not? Love that your mom (or aunt) made yogurt too! Okay, Jessica, that potato thing is perfect!! Great idea! And I grew up eating porcupine meatballs so I’d love to recreate this, thanks for the link. NT, this yogurt was also beyond delicious. I think homemade versions always are. Thanks for the book rec, KWu, I’m putting it on hold at the library immediately. Thank you! Mona, thanks for the tips for non-slow cooker users! 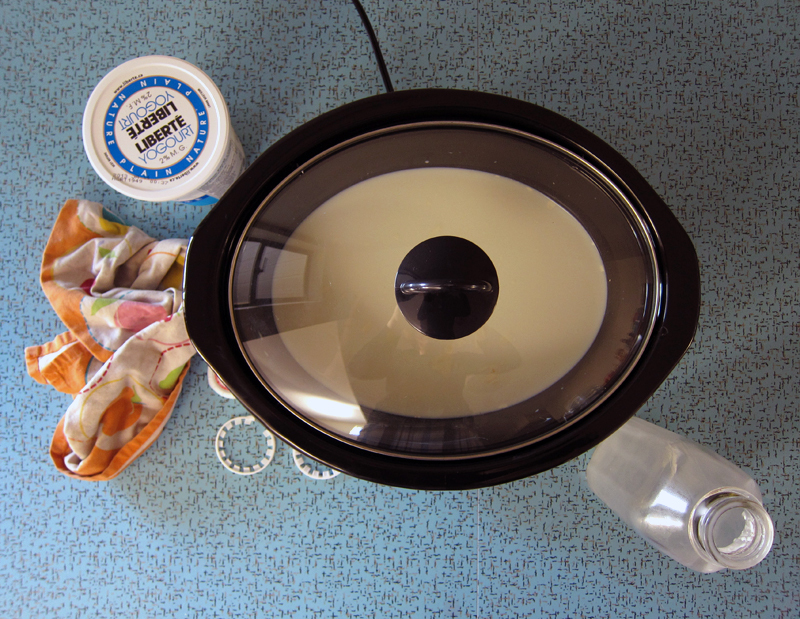 Maija, thanks for the links – I’m glad you’re loving your slow cooker! Thanks Elizabeth, if you do get one I’d be curious how you’d use it. I replace the collards with kale, and forgo the thyme, adding a few dashes of hot sauce instead. It’s delicious, everyone I’ve ever served it to has loved it, and it freezes well for later use! Thanks Carla, sounds delicious! I’ll be sure to give it a try! Hi! By some reason my yogurt didn’t turn out yesterday. I even left it over night. Can I try it again today with the same milk? (I just put it away in the fridge) I had half raw half normal 2% milk and half a cup plain yogurt and other half activia vanilla yogurt. Not sure what went wrong, but I don’t won’t to get rid of my raw milk. Please help! Hi Karina, I’m so sorry this didn’t turn out for you. I wouldn’t try it again with the same milk since the yogurt shouldn’t be heated up again. Maybe the milk didn’t heat up enough? Further research reveals that the milk should reach 180 degrees F. Once the milk got hot, did you make sure to let it cool down for 3 hours? If you just added yogurt to the hot milk, it wouldn’t work at all. As for your leftover milk, I’d use it in baking. I love using my slow cooker for all sorts of things. I figure anything that can be made in the oven, can be put in the slow cooker. I’ve not tried yogurt in my slow cooker yet, I’ll have to give it a go! It uses powdered non-fat milk and plain yogurt (as a starter). You make it in your oven and it is FAIL PROOF!!! Unless you forget to turn off the oven, you CANNOT mess it up. Thanks for sharing your recipe, I’ll definitely give it a try. I am not sure if you got all the answers you needed on crock pots. I make anything possible in a crock pot. Taco soup and roasted chicken/carrots and potatoes are favorites. I have done rice and beans and frozen them for easy use so I know what I put in there. Kidney beans are ones you have to watch out for. They need to boil for ten minutes to kill a toxin they produce. At least one other kind of beans, but not one I really use so I don’t remember. I have also roasted (small) pumpkins in the crock pot. Just pierce the skin and drop it in. I stole a brand new unused crockpot from my sister and am now looking I to what I can do with it. I have already made some pretty great stews of course. But will b trying this yogurt thing today! I’m quite excited about it! I want to learn more things to make and I saw one comment about butter and am def. saving this page to come back to that! Hopefully you find good uses for your slow cooker! It’s so nice to be able to throw something in there in the morning, not think about it all day, and magically have dinner at night.